There was a clunk at the glass kitchen door, and Maria exclaimed in surprise. I went outside and picked up the baby bird that had fallen to the ground stunned. I held it in the palm of my hand, holding a prayer in my heart as the tiny bird slowly turned its head. It blinked a few times and then closed its eyes. The soul flew away, and the body of the bird lay still. It was the first time I witnessed death so intimately. In moments, the candle of life departs the body. It could be today. I don't know when it will happen, but every moment slips by like the sand in an hourglass. How am I spending this precious moment of life? Yesterday is gone and tomorrow may never come yet I spend most of my days thinking about these phantoms of past and future. I feel the most alive in the vibration of love, peace, and joy. How can I attune to this vibration now? Why do I keep putting it off and seeking temporary pleasures? I must let go of all these frivolous activities and seek the root of life itself from whence the vibration of love, peace, and joy come from. What is the source of my existence? Life shines all around and who created it all? Let me seek this source with all of my heart and all of my soul and let all other seeking fade away. Let me dive in the depths of my being and discover the life force itself. Nothing else is important. I buried the body of the baby bird in the backyard. Thank you, my dear beloved bird. You are my friend, the messenger of my soul. You whisper in my ear, "Wake up! You, too, will fly away..."
These are the key qualities in a spiritual seeker. When one can remain peaceful in the face of hunger, then one does not worry about money or having enough food. Indeed, these things are the main cause of anxiety in our world. When one can wait, then patience dawns on the person. He or she no longer becomes anxious about achieving things anymore - getting the right job, raising children well, etc. All will come in time. When one's mind is in complete equanimity, then thinking becomes clear, focused and powerful, and life is very easy - undistracted by negative emotions. Today I am fasting and in silence. The mind wants to be distracted by food and speech and is pouring out so much negativity. I watch it pass and continue to follow the intention. It is a purification process in which darkness from the subconscious mind comes to the surface to be purged. None of these feelings and thoughts are permanent. They are clouds in the sky. Just let them pass. When I first started the fasting practice years ago, the mind would dread the day of fast. Now it is more at ease. Walking through the fire, impurities are burned away and the mind is cleansed. All practices are in honor of the One. The Truth. The Whole. Purna. Durga Devi - also known as Donna - opened her home to satsang. She stepped into the unknown, inviting her friends to this event. Satsang is unknown for me too. I'm surprised words come out of my mouth, considering I don't have any plans. "Can you tell me the format of the satsang?" Durga Devi asked. "No, I have no idea. Let's see what happens," I replied. I suppose this reply was not very comforting, but it certainly is mysterious. Truth is a Mystery. As I let go into the Mystery, I face all of my fears, nervousness and anxiety, and they dissolve in the Energy. My mind is fairly empty as satsang begins, and then the mouth starts talking about something. Where does it come from? During satsang, Cotton Candy (the almost blind dog) came up to me to visit and later on, the cat came to visit me. Seems that the animals really like satsang. Jeff, Durga Devi's husband, offered his help immediately in whatever he could do to support the satsang. I am so thankful for his welcoming presence. During the second satsang, the lighted candle behind me burst into bright flames. This was rather unusual. I picked up the candle to blow it out and burned my finger. Durga Devi brought some aloe vera plant to soothe the burn. Some days later, she came to a meditation in which I fell off my chair in a faint and burned my face on the rug. The face felt like it was on fire. 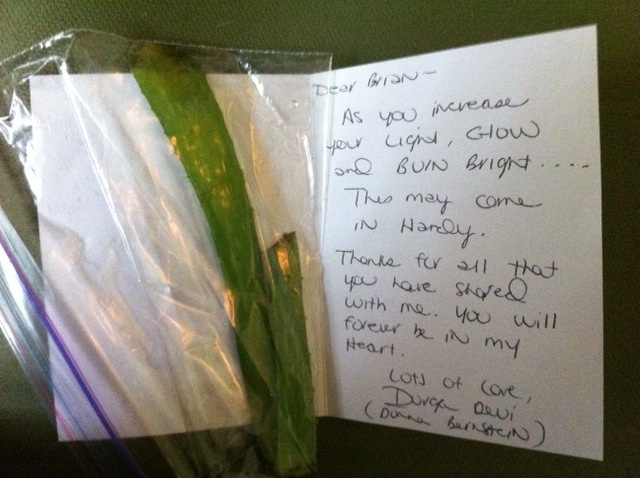 In a later satsang at Tina's home, Durga Devi gave me an envelope at the beginning, and I opened it. Inside there was a note which is attached below. It included a couple of aloe vera stems. I put some on my face and started to laugh and laugh. And now as I read this note, tears fill my eyes. I am here to serve You, dear Mother Divine. My life is for You. Let me wash Your feet with my tears of gratitude. After chanting for 20 minutes at the meditation group in White Plains, I took a deep breath and relaxed into a deep meditation. Suddenly I lost all sense of the world and thoughts passed by the mind very slowly. Their was a distant feeling of the neck cracking and the sound of gasps all around. Then opening my eyes, I looked around and wondered, "where am I? who are these people?" It appears I had fainted and I picked up my head from the floor and and sat back on the seat. "Are you ok?" they asked. I said, "I'm trying to find out who I am and where I am..." The group stared at me in concern, but I was totally at ease and relaxed. 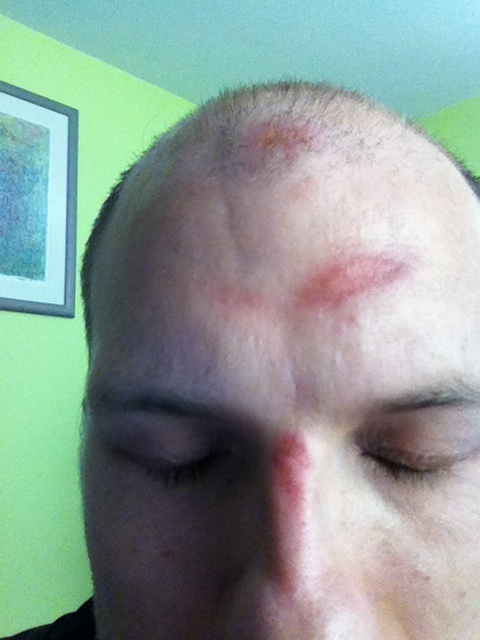 My face was on fire from the rug burns. They asked me if I might sit on the couch instead of on a precarious chair. "I'm good," I said as I grabbed hold of the sides of the chair. Overall, it was a very nice meditation. I'll think I'll go to the chiropractor tomorrow.